The garden has successfully survived relocation once again. My life has gone through many numerous twists and turns in the last month and a half, causing me to relocate once again. Luckily I was able to move my downsized garden without any issue (ok I lied, I snapped a stem on one of the tomato plants). The plants seem to have adapted to their new home well and are growing up just fine. From the last time you may have seen my current grapevine on the blog, it was nothing but a twig up until around the middle of march. Then it decided to explode into a giant mess of green foliage as the weather began to warm up. Today, I noticed that the clusters on it have begun to flower. 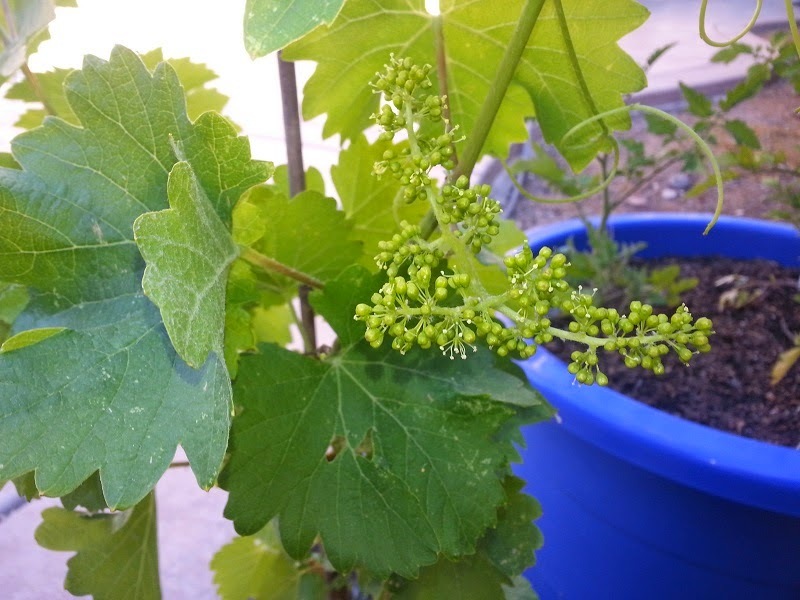 So there is a very good chance that I will see my first grapes this year! With my move in finally complete, I could now focus on expanding the garden again. Let's do this. To ensure that my tomato plants will be able to grow large and produce well, I purchased some tomato cages to give them support. I should mention now that the purchasing tomato cages is one of the more challenging garden improvements to make. First off, the cages really like to stick together in the stacks the stores sell them in. That can make removing the metal rims a tricky. Secondly, when removing said cages from each other, there is a very high risk of impaling yourself or someone else on the metal bits. Please be careful whenever you must be in contact with tomato cages. Some of the tomato plants have already started growing fruit in their small size as it is. They need a lot more time and energy to make it big though. As UC Davis' Picnic Day was yesterday, I had to go out and get myself another free grapevine to continue the legacy of my vineyard. What I did not count on this year was the help of some of my friends to secure multiple vines. This year I was able to acquire four new grapevines. Now with 1000% less Arsenic! Thanks to my old job, I learned a great deal about many of the grape varietals and some of their flavors. I strategically had my friends pick out certain ones so I could make some decent red blends in the future. The four I picked up were Aglianico, Barbera, Cabernet Sauvignon, and Syrah. There were many other unknown grape varieties I had not heard of that I could have chosen from, but I selected some creative reds from the list they had. It's the best I could do since Zinfandel was not a choice. (I'll discuss the grape varietals in a later update). To appropriately accomodate my new vines, I bought some new containers (5 gallon orange buckets from a well known hardware store), soil, gravel and some bamboo stakes. With any new container, putting drainage holes in the bottom is key to prevent any mold from growing in the bottom of it. It also prevents my vineyard from turning into a rice paddy. Following my own example from the last time I transplanted a grapevine, I filled up the bottom of each bucket with ~2 inches of gravel to allow for faster drainage and to potentially add some more nutrients to the soil. Filling each bucket with soil was the long and tedious part, but I used an empty 1 gallon plant pot to make the ordeal go quicker. Now it was time to transplant my little vines. 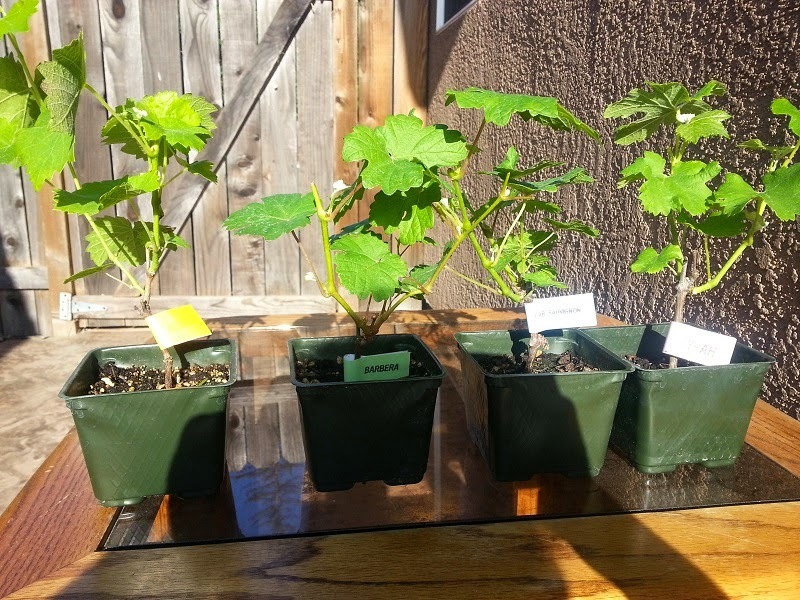 I made sure to loosen up the roots on each of the plants before planting them in the containers. This should allow the vines to quickly adapt to their new, larger container much quicker. The vines look so happy in their new home already! Once transplanted, I put a 5 foot tall bamboo stake in each container. This will be for support when the vines start growing taller and use their tendrils to keep themselves propped up. I may need to saw some of these down a bit if they start impaling people who come by to look at the vines. That concludes the garden expansion for today. It certainly felt great to increase my vineyard "acreage" by a factor of five in less than 1 day. As long as the weather is shining and mandatory water rationing doesn't affect the watering of my garden, all should go well this season. What a great day for some yardwork!